Q: WHAT IS MARSH & MCLENNAN AGENCY (MMA)? A: MMA is a wholly owned subsidiary of Marsh and is focused on becoming a dominant player in the North American middle market agency insurance distribution space. The middle market insurance sector is highly fragmented, comprising over 13,000 independent brokers representing over $30 billion in annual commission revenue. Q: WHY DID MARSH SET UP MMA AS A SEPARATE WHOLLY OWNED COMPANY? A: Marsh is predominantly focused on national and global risk management accounts and the organizational structure necessary to best service these accounts. The senior management of Marsh recognizes that the privately held middle market agency/client segment has a completely different culture and client attractions/service environment. Q: WHAT IS THE PRIVATE AGENCY CULTURE THAT MMA IS LOOKING TO ATTRACT? A: The privately held agency culture is a very entrepreneurial culture with a commitment to putting clients and colleagues first. This very culture is what has led to these firms experiencing great success, client attraction and continued growth in market share. Q: HOW IS MMA LOOKING TO PARTNER WITH THESE PRIVATELY HELD BROKERS? A: MMA is looking to build a partnership environment by acquiring privately held brokers and providing them with a leading position in continuing to drive the growth and operating strategies within their respective markets. MMA has not built an internal leadership team, but instead will rely on partnering with the leaders of the acquired firms to continue to drive growth and success. Q: WHAT CHANGES OCCUR TO THE AGENCY AFTER THEY ARE ACQUIRED BY MMA? A: The key strategy is that we want to leverage the best practices that have made the agency successful with the combined resources and capabilities of a larger organization. We will look to adopt a single brand strategy under the name “Marsh & McLennan Agency,” since many years and dollars have been spent building the name recognition in the market place. We, of course, plan on making a responsible transition from the agency’s current name to MMA, so as to maximize the branding opportunity. Additionally, we will look to share “best practices” from other MMA partner firms, so that we have an environment of continued learning and development. Q: WHAT IS THE MMA ORGANIZATIONAL STRUCTURE? A: MMA operates under a hub and spoke structure. 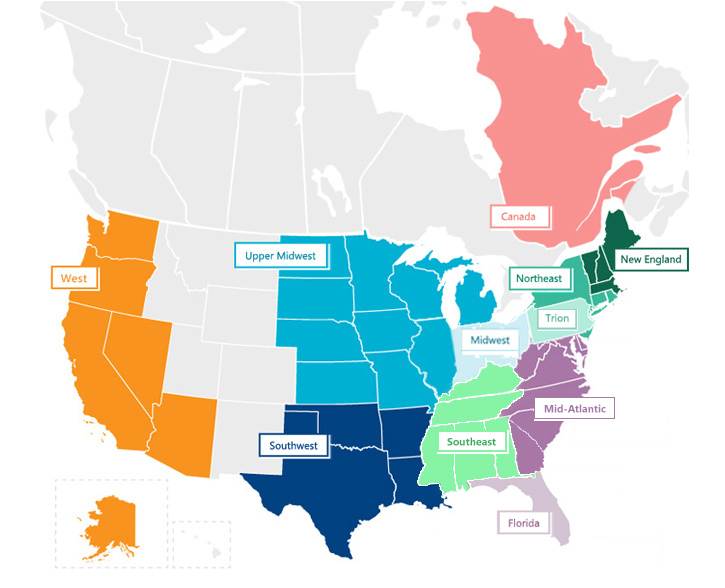 The hub operations take a leadership position in MMA’s eleven geographic regions – New England, Northeast, Mid-Atlantic, TRION (Pennsylvania), Florida, Midwest, Upper Midwest, Southeast, Southwest, West and Canada. We expand the regional capabilities by acquiring partner firms in contiguous cities, with those firms leading the growth and development of their local capabilities. Finally, MMA expands the breadth of hubs and spokes by partnering with fold-in acquisitions. Q: HOW WILL THE HUB AND SPOKE OPERATIONS INTERACT WITH THE CORPORATE TEAM FOR MMA? A: The goal for MMA is to drive the vast majority of all decision making at the hub and spoke operations, especially as it relates to growth and market objectives within their region. MMA corporate will remain fairly small in size, with the primary goal of being a resource to the operating companies. The MMA corporate team will primarily be composed of finance, operations, mergers & acquisition, technology, human resources and legal support capabilities. MMA corporate will have financial and oversight responsibilities in reporting to Marsh. Of course, MMC is a publicly traded company, so we have to operate responsibly in responding to the overall needs of the organization in a “structured entrepreneurial” environment. Q: WILL THE MMA OPERATIONS BE ABLE TO ACCESS CAPABILITIES WITHIN MARSH? A: Absolutely! One of the key dynamics of this opportunity is to leverage the entrepreneurial spirit of the agency operations with the significant capabilities imbedded in Marsh. Marsh’s resources span all industry sectors, specialty needs, and significant value added resources for MMA clients. We are currently working on a process to access and utilize these capabilities in a format that is simple, efficient, effective, responsive, and on an “as needed” basis. Q: WHO SHOULD I CONTACT IF I WOULD LIKE TO LEARN MORE ABOUT BECOMING A PARTNER WITH MMA? A: Please contact David Eslick, Chairman of MMA. Dave can be reached at 914-397-1602 or at david.eslick@marshmc.com.